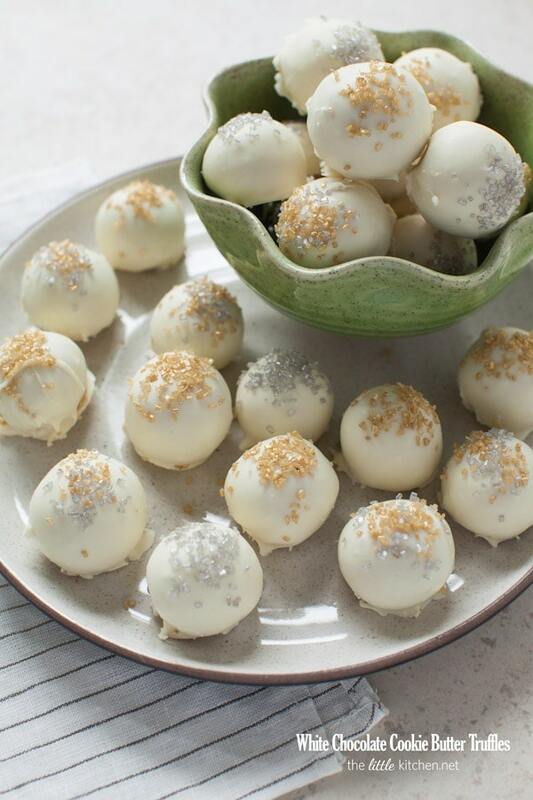 Yes, ’tis the season for truffles…and silver and gold. I mentioned earlier this year how I’m obsessed I am with gold sparkly sugar. I love the the way it looks on the white chocolate. It’s festive, right? I have an obsession with cookie butter / biscoff spread / Speculoos cookie butter spread, whatever you want to call it. A couple of years, I even made cookie butter cups! And milkshakes! And even frosting! 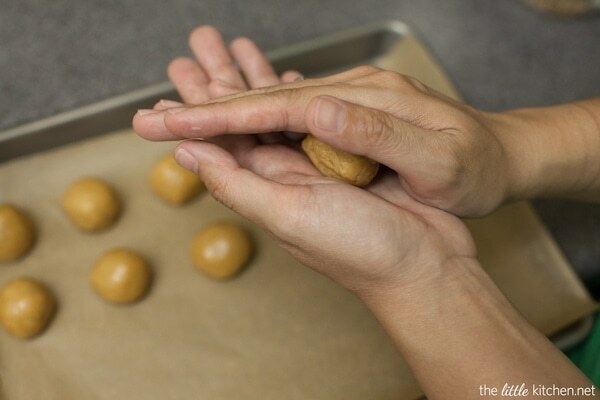 I made these peanut butter truffles a little while back and knew I just had to try it with cookie butter. The results? Divine. One thing I had to do was share and share these when I made them…otherwise I would have eaten ALL of it. 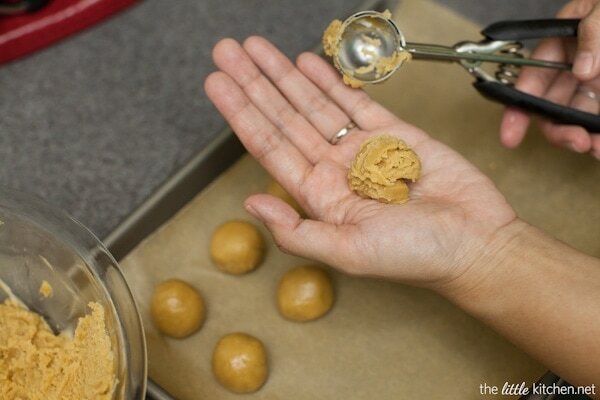 Making the cookie butter truffle filling is pretty easy. Once you chill the dough. 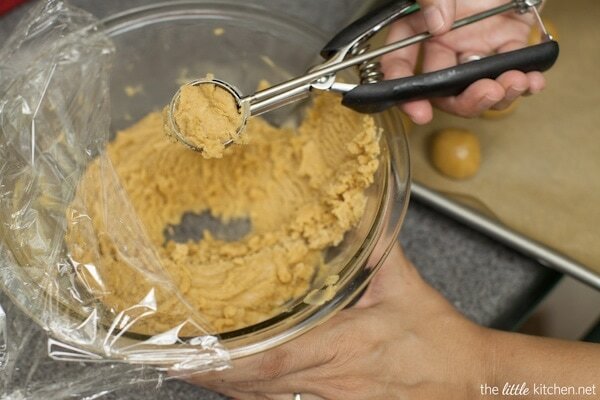 I scoop them out with these awesome small cookie scoops (which is 2 teaspoons). Place into the palm of your hand. And then roll it into a smooth ball. I bought a 2 tine and a 3 tine candy fork from Whisk and Bowl a while back. It has changed my candy making life. Seriously. They were like $5 each, I think? 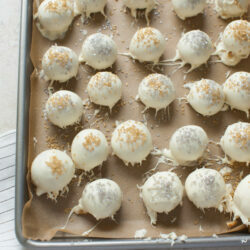 scoop white chocolate on top of the truffle. Just like that. And then tap the fork on top of the bowl to remove the excess. I use the 2 tine fork to help push the truffle ball off of the other fork. 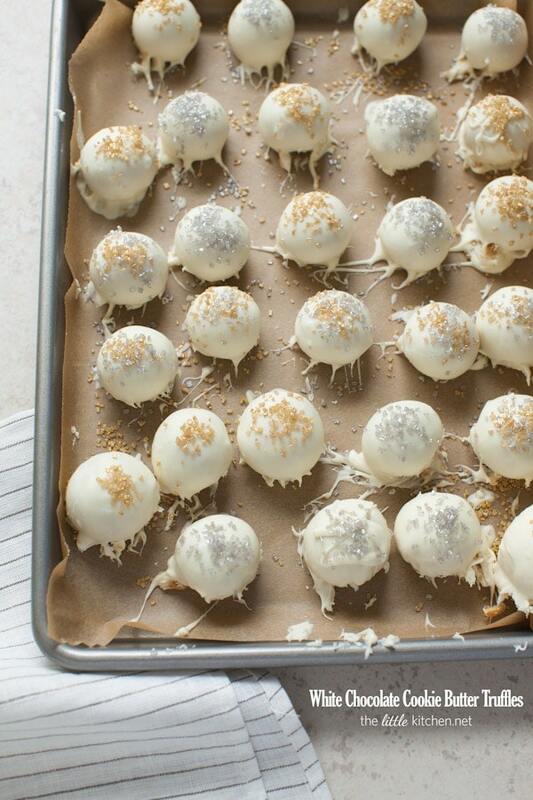 I usually dip 3 to 5 truffles and then go back to those and add the sparkly sugar or sprinkles on top. You don’t want to add them immediately after you dip them and you don’t want to wait so long the chocolate has set and they won’t stick. And there you have it, perfectly imperfect little truffles that are perfect for sharing, gift giving or for hoarding! I won’t tell anyone if you don’t share, I completely understand. Take a medium-sized heavy saucepan and butter the sides. Add sugar, evaporated milk, and butter to the saucepan. Turn heat to medium high, cook and stir until it's boiling. Reduce the heat to medium, allow to boil moderately for 5 minutes, stirring occasionally. Remove the from heat and add in marshmallows, biscoff spread, and vanilla. 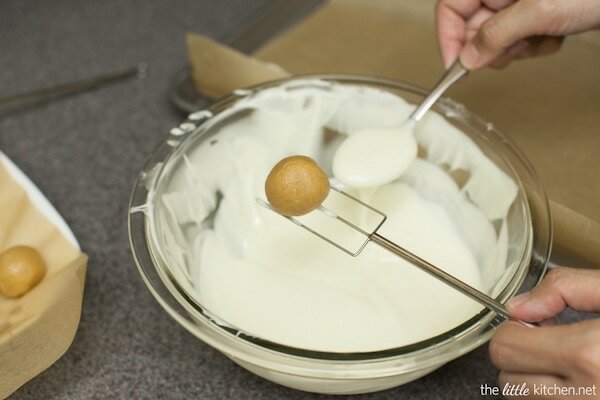 Pour mixture into a medium-sized mixing glass bowl. 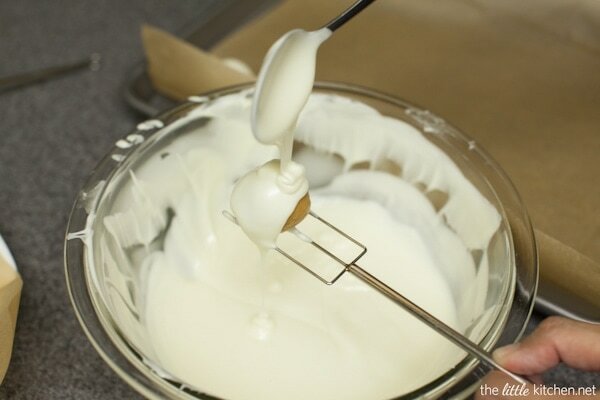 Refrigerate for at least 30 minutes to 45 minutes or until mixture is thick and can be shaped. 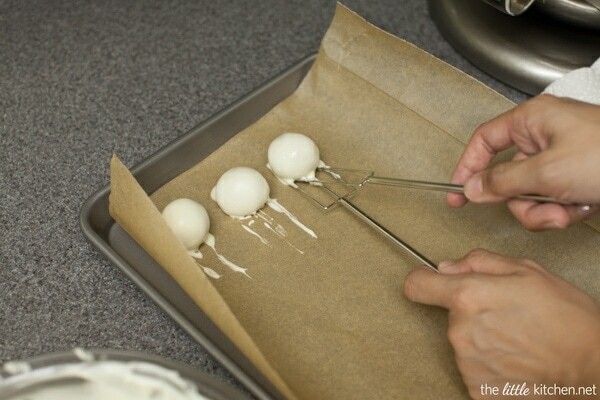 Take a baking sheet and line it with parchment paper or a silicone baking mat. 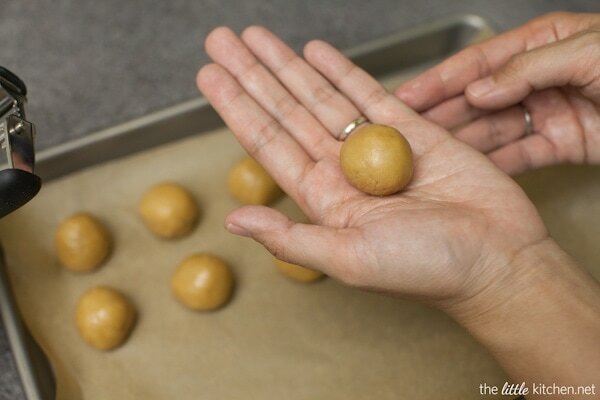 Using a small cookie scoop, scoop out portions and shape them into balls using the palms of your hands. Place on the lined baking sheet. 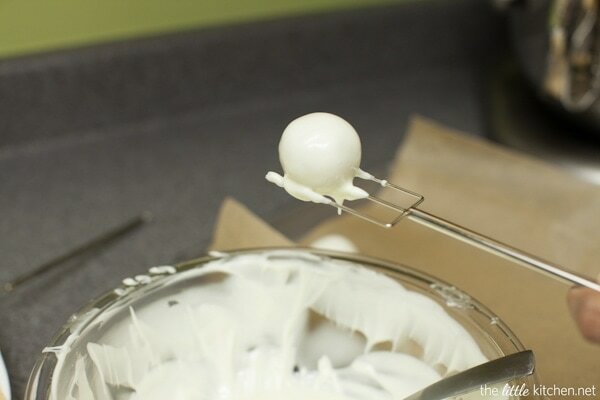 Freeze all shaped balls for at least 15 minutes. Add white chocolate chips and shortening to a small glass microwave safe bowl and microwave on 50% power in 15 second increments. It should take 45 to 60 seconds to melt, maybe longer. In between, mix with a spoon. Set up another baking sheet lined with parchment paper. 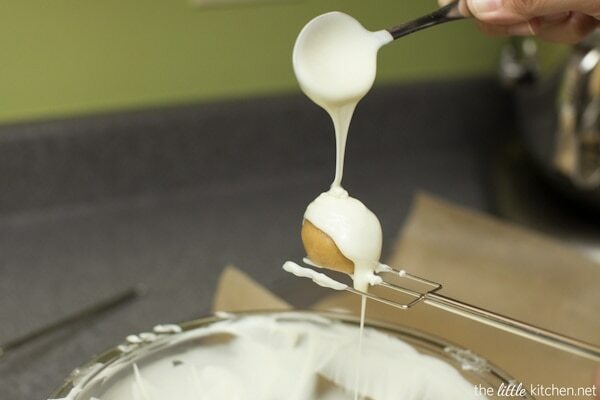 Using two forks or two candy forks, dip truffle balls into the melted white chocolate. Tap the top the bowl with the fork to allow excess chocolate to drip off. Place on the lined baking sheet. Dip 3 to 4 truffles and then add sparkly sugar or sprinkles to them. Allow them to set. 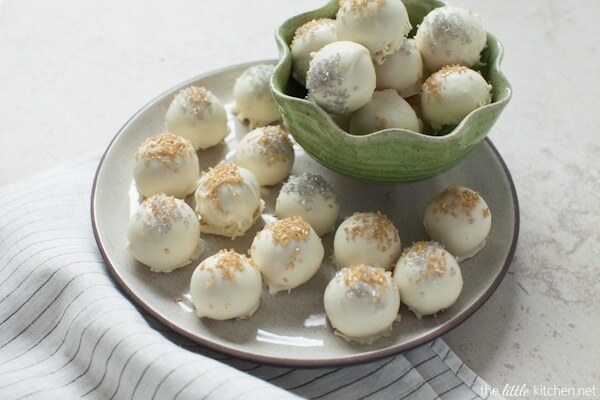 They set up even better when you refrigerate them for 15 to 20 minutes. Package them in cute little boxes for gifts! Disclosure: The links in this post contain affiliate links and I will receive a small commission if you make a purchase after clicking on my link. Thanks for your support!